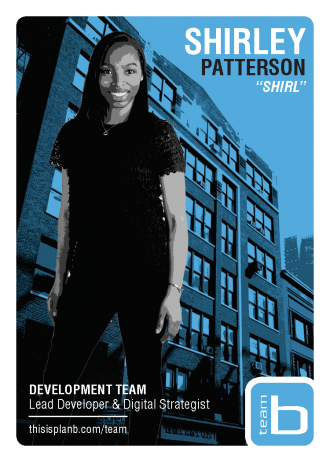 Shirley, the Lead Developer on our team, is a coding guru who helps make almost everything we do here possible. She breathes life into the digital designs the creative team sends her way through her expert full-stack developing skills. A Brooklyn native and Dartmouth graduate, Shirley has a long history of working with startups throughout New York and Chicago, and even helped start one in her downtime. A self-described digital nomad, Shirley welcomes any and all challenges that come her way. Shirley’s knowledge doesn’t stop at her coding abilities – she has as many interests as she does projects here at Plan B. Passionate about literature, learning Spanish through weekly classes, and snowboarding, Shirley’s curiosity and talent know no bounds.